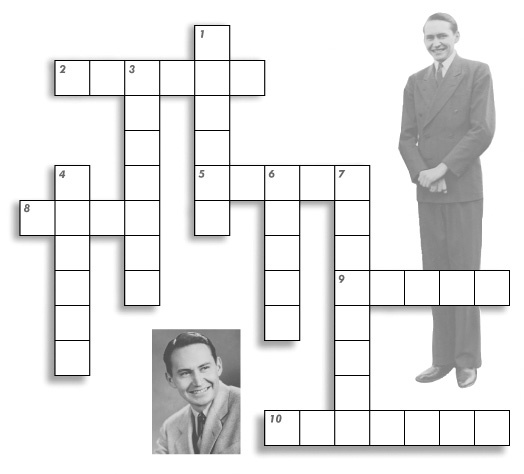 To learn more about Elder L. Tom Perry of the Quorum of the Twelve Apostles, choose from the list of words below to complete the crossword puzzle. Elder Perry said that he learned a lot about Church callings from his father, who served as a _______ for the first 18 years of Elder Perry’s life. Elder Perry married his wife Virginia Lee in the _______ Temple on July 18, 1947. After Virginia died in 1974, Elder Perry later married Barbara Dayton. Once when Elder Perry was working as a businessman, his bosses asked him to break a promise. Instead of compromising his morals, Elder Perry decided to _______ his job. Elder Perry is the father of _______ children. Elder Perry attended Utah State University where he studied _______ . When he was a boy, Elder Perry’s nickname was “_______ “ because he was so tall. While serving as a Marine during World War II, Elder Perry and one other Latter-day Saint soldier held church services every Sunday. They kept their sacrament supplies in a small trunk that was painted this color. Although this mission is now divided into many smaller missions, Elder Perry served as a missionary in the _______ States Mission.